An artist's impression of Little Hall. The arrangement is the first student accommodation transaction of its kind by the University and will see two residences – 303 Royal Parade and “Little Hall” – refurbished and constructed at the Parkville campus. The two residences will be developed and operated under the University of Melbourne brand and new accommodation guarantee. The University will retain ownership of both residences and have operational responsibility, including marketing and day-to-day pastoral care to students. AMP Capital, through asset services partner Spotless, has responsibility for facilities management services such as building maintenance. 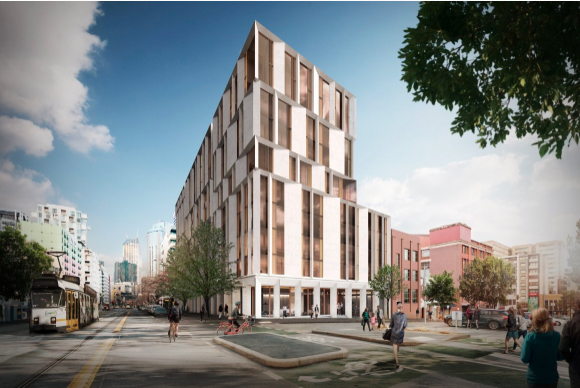 University of Melbourne Vice Principal Administration & Finance and Chief Financial Officer Allan Tait said providing high quality, diverse accommodation options operated by the University of Melbourne is a key priority. “As the University continues to grow, it is important that we find more dedicated student accommodation that is close to the Parkville campus," Mr Tait said. "These residencies have been designed to provide the highest quality facilities and amenities to support students in their academic endeavours. Mr Tait said the refurbishment of 303 Royal Parade is expected to be completed by January 2019 in anticipation of commencing students in Semester 1, while “Little Hall” is expected to be completed by Semester 2, 2020. “’Little Hall’ was established through an extraordinary $30 million gift to the University of Melbourne from Jane Hansen and Paul Little AO earlier this year," Mr Tait said. "In a unique philanthropic partnership with the University, the Hansen Scholarship Program has been launched and will offer 20 high-achieving students annually the financial, academic and social support needed to thrive in their undergraduate studies at the University, as well as support their transition to graduate studies or outstanding graduate careers. The University has been advised by Flagstaff Partners, Ashurst and Assured Solutions in relation to the student accommodation transaction.